The SAT Reasoning Test is the other common exam used by American institutions to measure levels of scholastic achievement in incoming students. 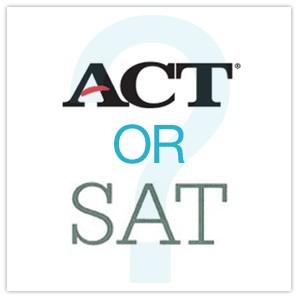 In the past, East and West Coast institutions required the SAT while the rest of the country required the ACT. However, the vast majority of colleges and universities now accept either exam. The ACT tests your knowledge of science while the SAT does not. The ACT tests your knowledge of higher mathematics, such as trigonometry. The SAT focuses much more on vocabulary knowledge. The ACT tests English grammar while the SAT does not. The ACT has no penalty for guessing on questions. I have heard that the ACT test is easier than the SAT test. Is this true? Every student is different! However, many people do find the format of the ACT test to be less daunting than that of the SAT test. The reason for this is that the ACT test focuses on content that you have learned about in school. It is very similar to the standardized tests that most American students are required to take throughout their years in school, so students are used to being tested in such a manner. Also, you do not lose points for guessing on the ACT! The SAT tests critical thinking skills. The SAT test can be more abstract and it can be harder to find the “best” answer. If you are great at thinking outside of the box and applying your knowledge to different situations, you will do well on the SAT. However, if you want to focus your efforts into showing off your knowledge of the content areas presented on the ACT test, then the ACT test is right up your alley. So, which test is right for me — SAT or ACT? You should choose the test which plays to your personal strengths. You should also consider your future area of study. For example, if you are going into the field of science, you should choose the ACT, an exam that has a section for this area. However, if you plan on going into a field that requires a great deal of critical thinking, such as law, the SAT may serve you better. Some institutions and programs still do have a preference for either the SAT or ACT, so be sure to do your research and see which test is preferred for the college or university in which you are interested.